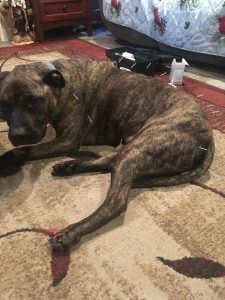 A 7 year old male neutered Pit Bull Terrier with progressive paraparesis of unknown etiology was treated symptomatically with acupuncture. While conscious proprioception improved mildly after three treatments of dry needling, the patient’s ataxia and hind end weakness continued to progress. Tanner is a 7 year old male neutered Pit Bull Terrier with a year long history of posterior ataxia progressing to paraparesis. When ataxia was initially noted, the patient was evaluated by his primary care veterinarian. Per the owner, bloodwork and radiographs at this time were within normal limits, and the dog was presumptively diagnosed with degenerative myelopathy. No further diagnostics were pursued, and no treatment or supportive care was initiated. The patient had no other medical history, continued to be bright and alert, and was eating well. 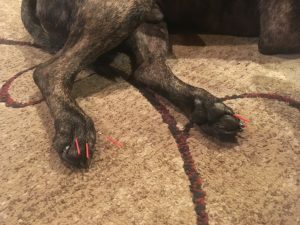 Due to the progression of Tanner’s paraparesis, the owner elected to try acupuncture treatments with the knowledge that little-no progress would be made in regaining function in the case of degenerative myelopathy. On initial presentation, the patient was noted to be in good body condition (body condition score 5/9), with moderate-severe symmetrical temporalis wasting and marked paraparesis. There was no pain on opening of the jaw. When ambulating, the patient was frequently knuckling over, crossing, or dragging the hind limbs. On neurologic examination, the patient was found to have absent conscious proprioception in the left hind limb and delayed conscious proprioception of the right hind limb. The left hind limb had mildly decreased spinal reflexes and absent withdrawals; the right hind limb had normal spinal reflexes and withdrawals. No crossed extensor reflex was appreciated. There was some slight muscle atrophy of the hind limbs. Evaluation of the forelimbs was within normal limits. Cutaneous trunci was absent caudal to the level of T12-T13. These findings localize the lesion to T8-T12 (0-4 vertebral spaces cranial to cutaneous trunci cut-off). The patient had full range of motion in the cervical region and no pain on spinal palpation. Myofascial evaluation revealed tight bands in the splenius muscles bilaterally. Pain was appreciated on palpation just cranial to the scapulae in the omotransversarius, and trigger points were noted diffusely throughout the latissimus dorsi muscles bilaterally. Differential diagnoses for paraparesis include fibrocartilaginous embolism, discospondylitis, meningioma, degenerative myelopathy, chloramphenicol administration, spinal bifida, polyarthritis, vertebral fracture, hypothyroidism, and trigger point pathology. Differential diagnoses for temporalis muscle wasting include generalized ischemic dermatopathy, protozoal myositis, nerve sheath tumors, cachexia or aging, degenerative myelopathy, prednisone administration, canine familial dermatomyositis, masticatory myositis, trigeminal nerve injury, hyperadrenocorticism or hypothyroidism, and compression of the trigeminal nerve secondary to myofascial restriction. Degenerative myelopathy is the most likely cause of Tanner’s paraparesis based on the progressive nature of the disease and lack of pain on spinal palpation. Fibrocartilaginous embolism would be expected to improve with time, and a congenital cause is unlikely at Tanner’s age. Infectious etiology or fracture would typically result in identifiable radiographic changes (although they may not have been evident at time of initial evaluation), as well as pain on palpation of the affected segments. There is no history of medications, and no joint effusion or lameness was present. While end-stage degenerative myelopathy can result in muscle wasting, more significant muscle wasting of the hind limbs would also be expected if the temporalis atrophy was due to degenerative myelopathy alone. Lower motor neuron signs were present in the left hind limb, which is consistent with progressed degenerative myelopathy. It is possible that the temporalis muscle atrophy noted in this patient is caused by a concurrent condition, or that a slowly-progressing neoplastic etiology is the root of both issues. Repeat radiographs, bloodwork, and testing for SOD1 mutation, along with MRI, CSF evaluation, and muscle biopsy, would be indicated to gain definitive diagnoses. Due to the clinical suspicion of degenerative myelopathy, realistic expectations were discussed with the owner. Degenerative myelopathy is a progressive disease with no known cure. While acupuncture can result in functional neurologic recovery in other neurologic cases, this has never been documented in cases of degenerative myelopathy. 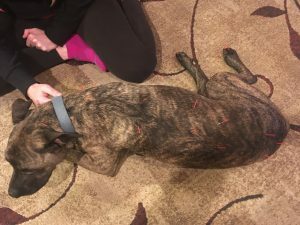 Rather, acupuncture has been used for degenerative myelopathy in attempts to slow progression of disease (with no proven results) and to treat any compensatory pain due to increased load on the front end. If Tanner did show clinical improvement, this would be indicative of a different etiology. Acupuncture treatments were aimed at relieving compensatory muscle strain patterns, and stimulating nerves at the level of neurolocalization, as well as nerves supplying the hind limbs. As compensatory strain patterns differed at each treatment, needles were placed based on patient reaction to palpation at each session. Treatments were spaced approximately one week apart. Treatment 1: Points treated included GV 20, GV 14, taut bands in the splenius muscle bilaterally, the Ah Shi points identified in the omotransversarius bilaterally, BL 17, the un-named point at the level of T9, BL 19, BL 21, BL 25, Bai Hui, and Ba Feng points. All points were treated bilaterally using Seirin 0.16 x 30 mm needles. Treatment 2: Points treated included GV 20, taut bands in the splenius muscle bilaterally, BL 17, the un-named point at the level of T9, BL 19, BL 21, BL 25, Bai Hui, ST 36, a trigger point identified in the left quadriceps, and Ba Feng points. ST 36 was treated on the left side only, as the patient was laying in right lateral. All other points were treated bilaterally. Seirin 0.16 x 30 mm needles were used to treat GV 20, ST 36, and the Ba Feng points; Seirin 0.20 x 30 mm needles were used to treat all other points, as the patient tolerated the first treatment well. Treatment 3: Points treated included GV 20, Ah Shi points in the omotransversarius bilaterally, Ah Shi points identified in the long head of the triceps bilaterally, BL 17, un-named point at the level of T9, BL 19, BL 21, BL 25, Bai Hui, ST 36, GB 30, and Ba Feng points. The patient was again laying in right lateral, so ST 36 and GB 30 were treated on the left side only. All other points were treated bilaterally. Distal limb points and GV 20 were needled with Seirin 0.16 x 30 mm needles, and all other points were treated with Seirin 0.20 x 30 mm needles. Needles were left in place for approximately twenty to thirty minutes. At each session, GV 20 and Bai Hui were routinely needled first, in order to stimulate the parasympathetic nervous system and achieve patient relaxation. BL 17, the un-named point at the level of T9, BL 19, and BL 21 were chosen to stimulate the area of neurolocalization. Spinal nerve roots L4-S1 supply the hind limb, so BL 25 and Bai Hui were treated to target the mid-caudal lumbar spinal nerves. GB 30 was used to specifically target the sciatic nerve, and Ba Feng points were needled due to the great amount of stimulation available at those distal points. ST 36 was chosen to stimulate the fibular nerve, for its neuromodulatory properties, and to stimulate the immune system due to lack of definitive diagnosis. After each treatment, the epaxial muscles were massaged thoroughly using petrissage and effleurage techniques. After three treatments, the patient’s paraparesis was worsened, but conscious proprioception of the right hind limb was within normal limits. There were no other changes to the neurologic exam. Muscle tension in the front end was subjectively decreased. Progression of paraparesis is consistent with degenerative myelopathy, and lack of functional recovery in this case further supports data claiming that acupuncture is not an effective treatment for degenerative myelopathy. However, in this case, acupuncture did improve conscious proprioception and treat compensatory myofascial pain. As there was no control, it is unknown whether this patient may have deteriorated more quickly without acupuncture. There were no adverse effects related to treatment of this patient with acupuncture. As discussed with the owner, other supportive care or alternative therapies that could be instituted include diet changes, booties to improve traction in the hind limbs, physical therapy, electroacupuncture, and laser therapy (laser therapy should be instituted only after neoplasia is definitively ruled out). It is also possible that this patient may have had better response or slower progression of disease if supportive care had been initiated at time of onset of clinical signs, rather than late in the disease course. 1. In Heo, Byung-Cheul Shin, Young-Dae Kim, Eui-Hyoung Hwang, Chang Woo Han, and Kwang-Ho Heo, “Acupuncture for Spinal Cord Injury and Its Complications: A Systematic Review and Meta-Analysis of Randomized Controlled Trials,” Evidence-Based Complementary and Alternative Medicine, vol. 2013, Article ID 364216, 18 pages, 2013. 2. Kline K, Caplan E, Joseph R. Acupuncture for neurologic disorders. In Schoen AM (ed), Veterinary Acupuncture, Ancient Art to Modern Medicine. Mosby, 2001. 179–192.